It’s Wednesday “HUMP DAY” and you are coming off an exciting weekend, your fired up because you have been working hard on your fitness, and are seeing some results. That is awesome, and let’s keep up the great work. Now, let’s dive a little deeper into what is happening to your body. Did you know that our bodies are working constantly on a 24 hour basis to repair and grow our cells? Our bodies are so unique in their ability to fix issues which we may not even sense are going on. That is why it is so important to make healthy choices when it comes to nutrition. Let’s say, as an example, our body needs 2000 calories to operate on a daily basis. If we consume 1500-1800 calories we are now at a caloric deficit which would normally lead to weight loss. It we go a step further and drop down to 1000 calories or 500 calories in hopes to lose weight, now we have gone into a conservation of energy phase. We are not going to lose weight because this is going to trigger our bodies to store energy. As stated earlier, our bodies are unique in their ability to fix issues and in this low calorie situation our bodies sense that we are not getting enough calories to survive so it stores those calories as fat. Fat has 9 calories per gram of energy that our bodies will consume to sustain life. Our bodies are programmed to deliver nutrients to sustain life and the nutrients will get to our vital organs such as heart, brain, lungs, liver, and kidneys. Have you ever noticed that people who eat 1 or 2 times a day tend not to lose weight very successfully? Here is one reason why. Energy needs for your body’s basic functions stay fairly consistent and are not easily changed. Metabolism is the process by which your body converts what you eat and drink into energy. During this complex biochemical process, calories in food and beverages are combined with oxygen to release the energy your body needs to function. Even when you’re at rest, your body needs energy for all its functions, such as breathing, circulating blood, adjusting hormone levels, and growing and repairing cells.Your basal metabolic rate accounts for about 70 percent of the calories you burn every day. In addition to your basal metabolic rate, another factor determines how many calories your body burns each day. Food processing or thermogenesis is the digesting, absorbing, transporting and storing of the food you consume. Thermogenesis also takes calories. It accounts for 100 to 800 of the calories used each day. For the most part, your body’s energy requirement to process food stays relatively steady. This process is minimal in people who eat 1 to 2 meals a day. Now, think about your desire to continue to lose weight. The key to your weight loss is finding the proper balance in your food intake and the energy that you expend during your fitness routine. Did you know that the more muscle you have, the more calories you burn? There is a BIG MISCONCEPTION that muscle weighs more than fat, a pound is a pound regardless if its muscle or fat. 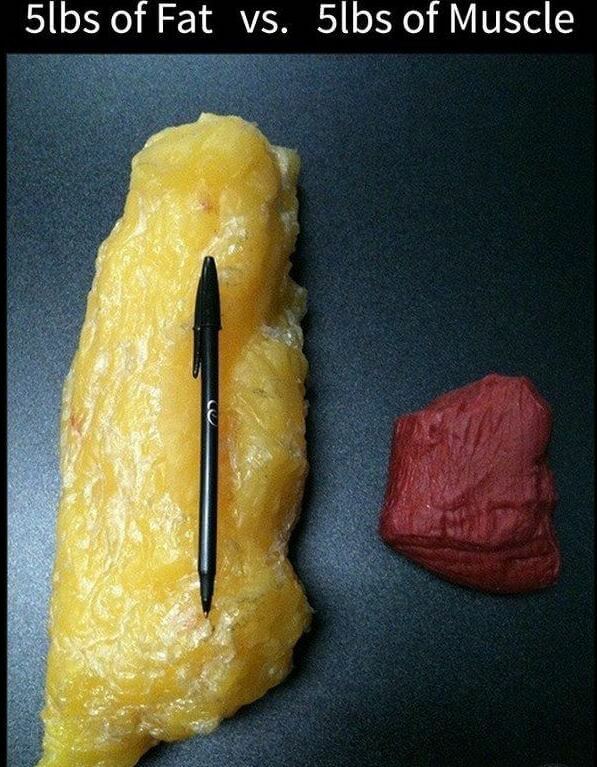 Muscle is more dense than fat so 1 pound of muscle takes up less space than 1 pound of fat. Your muscles need energy in order to contract and that is why you must consume the proper nutrients on a daily basis. Your metabolism and muscle mass go together. You want to be at a caloric deficit not because you are starving yourself, but because you are burning up calories in your workout. After you burn up these calories, you do not want to over consume nutrients because you are hungry. This is where your self control comes into your success. You must eat a well-balanced, nutrient-dense meal after your workout, and not eat until you are stuffed. Please do not think that because you worked out, it gives you the ok signal to stuff yourself with more calories than you just burned off. You will be disappointed in your lack of weight loss and muscle toning. So, as you continue to lose those pounds and inches this week, remember that there is a major process going on inside your body. You must give yourself the proper fuel spaced out over 6-7 small meals to keep your body doing what it needs to do in order to sustain life. You will continue to lose weight and inches as long as you remain consistent with your nutrients and exercise.